Most dealers have been suffering from the auctions for quite a while, eating at their profits. Most dealers want to find ways to decrease the pain of today’s margin compression and increase profitability. But how? What are their options? Buying used cars from private sellers certainly has its benefits. Increased profitability, higher quality inventory, and community outreach to name a few. But while these benefits have their appeal, realizing them can take some work. The work involved isn’t particularly difficult to understand, but it does take genuine effort and commitment. It also involves a defined process, well-trained people to execute, and the right technology. So how can dealers ensure they are set up for success with buying used cars from private sellers? In this video, we discuss three key factors that contribute to a dealer’s ability to thrive in acquiring used vehicles from private sellers. 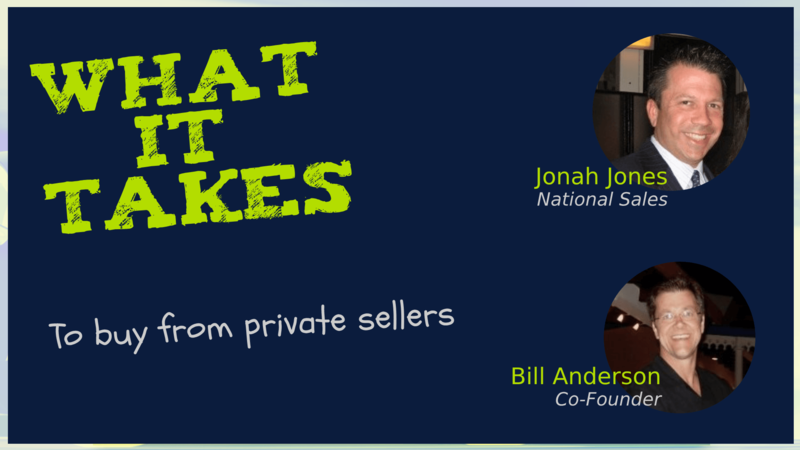 The video features VAN Co-Founder Bill Anderson, and National Sales Director Jonah Jones. Nobody can argue that Carmax is not only outselling everybody, but for the most part out profiting everybody on a per-car basis. CarMax generates more than $350M per quarter retailing about 160,000 used cars. That averages to approximately $2,200 per unit front-end profit. Now, is that because of their volume, or is it because they put consumer acquisitions at their core? And if it’s the latter, then what makes it so effective and profitable? Of course, a process without people is useless. You do need the right people in place. You need at least one champion to own the process, and lead the people behind it. Whether that is one person, or several, ownership of the process is key. With a champion, your process can be executed. And as you will see in this video, the process boils down to a few steps: being proactive, being responsive, being courteous, and following up. In fact, if you look back at previous VAN University webinars, we explore these ideas repeatedly. Another essential ingredient for success is technology. Without the right tools and the best information, you can’t realistically gain an edge. This is where VAN comes in, primarily. Vehicle Acquisition Network provides dealers with the best information and the necessary tools. Two essentials for seeking out and identifying private sellers that have the vehicles you need. Combined with the learning and development aspects, Vehicle Acquisition Network provides a well-rounded suite of resources for dealer success. Tom has been in the automotive industry over half his life. Having held all management positions in sales, Tom has an in-depth understanding of the business. His passion is pre-owned management and how it relates to marketing.